The Watershed management manages the watershed with various watershed interventions. The suitability of a particular watershed intervention depends on existing environment. The existing environment is mainly govern by prevailing climatic condition .The existing natural resources plays an important role in selection of watershed treatment. The watershed approach is the main focus of Watershed management. 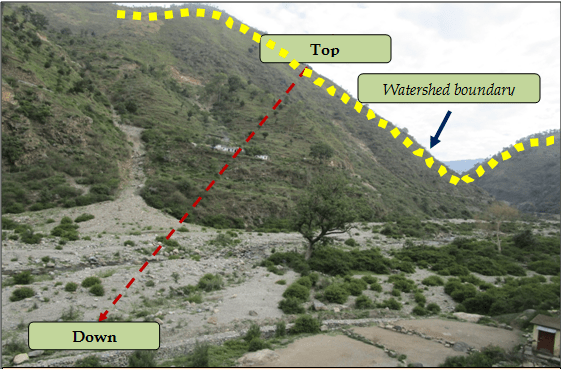 A correct approach helps in successful watershed management. It ensures that the upper area in a watershed is treated first and then watershed treatment is done down to the watershed boundary in a sequential manner. If upper catchment is not treated first and treatment is done in down ward region then there is every possibility that silt from upper side can fill the water harvesting structures thereby, reducing the efficiency of water harvesting structure. Hence, it is important to follow standard approach of watershed management.